This is an article about the young person in the Scouting movement. For other meanings see Girl Guides. A Girl Guide is a girl, usually 11 to 17 years of age, participating in the worldwide Scouting movement. This movement began in 1907, when Robert Baden-Powell held the first Scout camp on Brownsea Island, South England. To advance his ideas, Baden-Powell wrote the book, Scouting for Boys, which targeted boy readership, and described the Scout method of using outdoor activities to develop character, citizenship, and personal fitness qualities among youth. The girls movement began in 1909 at The Crystal Palace in London, England, where Baden-Powell encountered a number of Girl Scouts in Scouting uniform and saw the demand for a similar programme for young women and girls. Girl Guides are organised into troops averaging twenty to thirty girls under guidance of a team of Scout leaders. Troops subdivide into patrols of about six Guides and engage in outdoor and special interest activities. Troops may affiliate with national and international organisations. Some troops, especially in Europe, have been co-educational since the 1970s, allowing boys and girls to work together as Scouts. There are other programme sections for older and younger girls. The term Girl Scout is used in the United States and several East Asian countries. The two terms are used synonymously within this article. Women have been involved in Scouting since its earliest days. Charlotte Mason first perceived the educational possibilities of Scouting as applied to children. In April 1905, she put Baden-Powell's Aids to Scouting on the syllabus of the Parents' Union School. Baden-Powell later credited Katherine Loveday, a governess trained by Mason, as the means of inspiring Scouting for Boys. 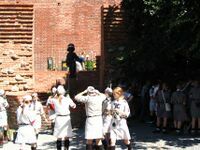 Girls themselves have chosen to be involved in Scouting since the publication of Scouting for Boys in 1908. In the UK, girls set up their own patrols, sometimes affiliated to local Boy Scout troops, sometimes existing on their own. In New Zealand, the Peace Girl Scouts began in 1908. In September 1909, a number of girls turned up to the first Scout Rally at the Crystal Palace, calling themselves Girl Scouts. This was a turning point for girls in Scouting: Baden-Powell accepted that girls were going to be involved in Scouting. In the October issue of Boy Scout Headquaters Gazette, a monthly newspaper for scoutmasters, an instruction appeared that all applications for membership for Girl Scouts or Girl Guides should be sent directly to headquarters, as arrangements were being made for them. A month later, in the same publication, The Scheme for Girl Guides was published. Baden-Powell knew that the girls needed a separate organisation if it were to be successful and if it were not to prejudice the success of the Boy Scout movement. The Girl Guides were named after the famous corps of guides in India, the Khyber Guides. Many girls in the UK who had been Girl Scouts were suspicious of these new developments but were persuaded to accept them. A troop of B-P Girl Guides was only started recently. I know many who read this will shake their heads and say 'No earthly good; it will make the girls tomboys'. Well, the girls about here are already that. But to clear up a misconception, may I say that the Girl Guides are quite distinct from the so-called Girl Scouts, or for that matter, the Boy Scouts. While Agnes played a major role until her death in 1945, Baden-Powell's wife, Olave Baden-Powell, became Chief Guide of England in 1918, and World Chief Guide in 1930. Baden-Powell wrote a separate handbook for the new organisation, The Handbook for the Girl Guides or How Girls Can Help to Build Up the Empire (1912). In 1914 a junior branch, originally called Rosebuds shortly changed to Brownies, parallel to Wolf Cubs in Boy Scouts, began. Girls can joins young as 5 years old in some countries. At this age, they are called "Sparks" in Canada, "Daisies" in the United States, and by various other names in the more than 150 countries that participate in the Guiding and Scouting Movement. 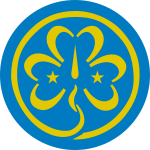 Today, the World Association of Girl Guides and Girl Scouts (WAGGGS) is the world's largest organization of girls and women. Guides have come a long way since they were founded after the Crystal Palace rally and the new programmes for all sections reflect current values and interests. A Girl Guide learns the cornerstones of the Scout method. These are designed to instill character, citizenship, personal fitness, and leadership in girls through a structured program of activities. Most of these activities are conducted on the unit level. Girl Guides can partake in a variety of programmes from outdoor challenges like climbing and canoeing to skills such as first aid. Guiding aims at giving girls new opportunities like international travel, camping, community service projects, and trying new activities. These activities are designed to teach girls to contribute to society, develop spiritually, encourage teamwork, gain pride in achievement, and to acquire self-respect and leadership. Local groups, called variously units, companies or troops are the fundamental unit of the Girl Guides. These are run by an adult, normally a woman aged 18 to 65. She has responsibility for the girls in her group and plans out activities for the girls as well as leading the meetings. These leaders are supported by assistants. Meetings are held anywhere from weekly to monthly depending on the commitments of the participants and the activities in progress. Individual national or other emblems may be found on the individual country's Scouting article. Uniform is a specific characteristic of Scouting. Robert Baden-Powell, at the 1938 World Jamboree, said it "hides all differences of social standing in a country and makes for equality; but, more important still, it covers differences of country and race and creed, and makes all feel that they are members with one another of the one great brotherhood". Jersey of company colour. Neckerchief of company colour. Skirt, knickers, stockings, dark blue. Cap - red biretta, or in summer, large straw hat. Haversack, cooking billy, lanyard and knife, walking stick or light staff. Cape, hooked up on the back. Shoulder knot, of the 'Group' colour on the left shoulder. Badges, much the same as the Boy Scouts. Officers wear ordinary country walking-dress, with biretta of dark blue, white shoulder knot, walking stick, and whistle on lanyard. Guide uniform varies widely with culture, climate and the activity undertaken and has frequently changed through history. They are often adorned with badges indicating a Guide's achievements and responsibilities. Uniforms within each organisation are often different for each age group. Brownies often wear brown clothing. In some places, uniforms are manufactured and distributed by approved companies and the local Guiding organisation. In other places, members make uniforms themselves. ↑ "Aids to Scouting" (html). Johnny Walker's Scouting Milestones. 2006. http://www.scouting.milestones.btinternet.co.uk/aids.htm. Retrieved 2007-01-22. ↑ "Be Prepared" (html). DGS: Scouting, Interview from Listener magazine. 1937. http://www.dshearer.fsbusiness.co.uk/sctfiles/bp_talks.htm. Retrieved 2007-01-22. ↑ "Baden-Powell and the Crystal Palace Rally". Baden-Powell Photo Gallery. Pinetree web. 1997. http://pinetreeweb.com/bp-pix76.htm. Retrieved 2007-01-22. ↑ 4.0 4.1 4.2 Kerr, Rose (1976). Story of the Girl Guides 1908-1938. London: Girl Guides Association. ↑ "History of the Girl Scouts Movement". Girl Scouts of the Philippines. 1997. http://www.msc.edu.ph/gsp/histo1.html. Retrieved 2007-01-22. ↑ "Who We Are" (HTML). Girlguiding UK. http://www.girlguiding.org.uk/xq/asp/sID.146/qx/whoweare/article.asp. Retrieved 2007-01-05. ↑ Wade, E.K. (1957). "27 Years With Baden-Powell" (PDF). Why the Uniform?, ch 12. Pinetree.web. http://pinetreeweb.com/wade12.htm. Retrieved 2006-07-24. This page was last edited on 8 November 2014, at 14:50.